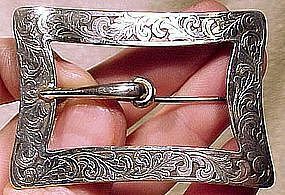 A 19thC Dutch sterling silver belt buckle from 1864. This heavy, hand made and engraved belt buckle is fully hallmarked for 1864. 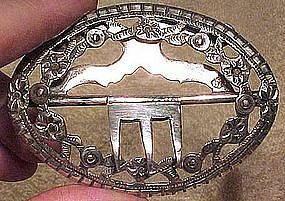 This 2-7/8" x 2-1/4" hand made buckle weighs 1.25 ounces, and it has an AT over 64 maker's mark, the lion passant silver purity mark, Minerva head mark, and the letter mark for 1864. This item has an overall measurement of 2-15/16" x 2-3/16", and it has an inner or belt measurement of 2" x 1-3/8". It is in excellent vintage condition with no cracks, scrapes, monograms, bends, corrosion, losses, damage or repairs. All items are thoroughly and conservatively graded and all condition issues are noted; all items are vintage or antique and may have slight signs of gentle use. Expedited tracked and insured parcel shipping to the U.S. starts at $21 (other spots may vary, air is higher). Items paid with a credit card will be shipped to confirmed addresses only. We do ship internationally. All of our prices are in $US. PLEASE NOTE: We DO NOT accept PayPal. An Art Nouveau period sterling silver buckle shape sash brooch circa 1900 1910. 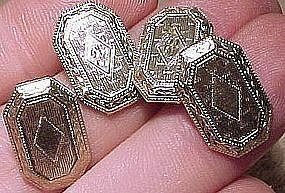 This antique 2-1/2" x 1-5/8" pin has ornate deep hand engraving. It closes with a c-clasp and it has STERLING as well as P&B in hearts maker's mark for Paye & Baker Mfg. of North Attleboro, MA (1901-1960?). This item is in excellent condition with no monograms, corrosion, losses, damage or repairs. Expedited tracked air post starts at $19 (to the US - other spots may vary) - insurance included. Items paid with a credit card will be shipped to confirmed addresses only.All of our prices are in $US. PLEASE NOTE: We DO NOT accept PayPal, only VISA and MASTERCARD. 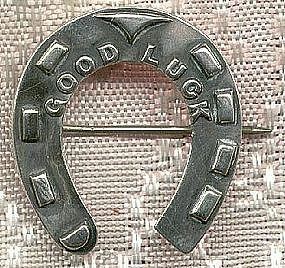 A Victorian Good Luck sterling horseshoe pin circa 1880s. This vintage Victorian piece of sterling silver sporting jewellery measures 1" x 1-1/8", it closes with a c-clasp and it is of typical late 19th century hollow construction and it has a finely detailed relief design on the front. It is unmarked, not uncommon on Victorian pieces of this period, but it tests as sterling grade silver. This item is in excellent antique condition with no dents, monograms, bends, corrosion, losses, damage or repairs. All items are thoroughly and conservatively graded and all condition issues are noted; all items are vintage or antique and may have slight signs of gentle use. Tracked Packet shipping to anywhere in the U.S. is $14.00 - this includes online tracking, air service and insurance up to $70. Items paid with a credit card will be shipped to confirmed addresses only. We do ship internationally. All of our prices are in $US. PLEASE NOTE: We DO NOT accept PayPal. An early Royal Worcester porcelain cake stand with a pleasing Chinese style design in green and blue c1894. This 8-1/2" diameter stand is 1-3/4" high, and the design consists of green flowers and blue leaves and tendrils in a wide border with a large central design with a planter; it also has two small formal borders. It has the year mark for 1894 and a 546206 registry number. This item is in very good condition with no chips, cracks, crazing, staining, repairs or damage other than some slight flecks to the green upper rim paint trim and some minor cutmarks, only a few of which slightly affect the design. Expedited tracked shipping starts at $20 (to the US - other spots may vary). Items paid with a credit card will be shipped to confirmed addresses only. We do ship internationally. All of our prices are in $US. PLEASE NOTE: We DO NOT accept PayPal. A finely detailed late Victorian adjustable child's sterling silver bangle c1900 (3/16" wide bangle measures 1-7/8" x 1-3/4" at rest and 3/16" wide, marked STERLING SILVER,deep and crisp design with leaves and berries on a lined ground) and a larger 2-3/8" x 2-1/4" spring style expanding bangle of the same vintage (1/8" wide, maker GJ LTD). These items are in excellent condition with no losses, dents, monograms, corrosion, repairs or damage. Surface shipping is $5.50 (to the US - other spots may vary) - insured is higher, and mandatory on items over $85 if paid with a credit card. We do ship internationally. All of our prices are in $US. 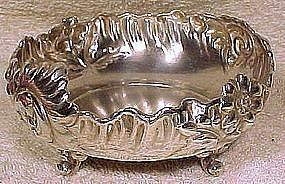 A fine quality ornate silverplated footed nut or candy dish c1890, made by Simpson Hall Miller & Co. This 2-1/8" tall and 4-3/4" diameter dish has deeply impressed floral and leaf designs and it has the pattern number 1709. This item is in excellent condition with no losses, dents, monograms, corrosion, repairs or damage other than possible replating. Small packet air post starts at $9.50 (to the US - other spots may vary) - insurance is included. We do ship internationally. All of our prices are in $US. PLEASE NOTE: We DO NOT ACCEPT PAYPAL, only VISA and MASTERCARD. 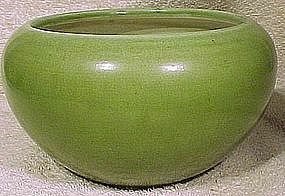 A lovely Arts and Crafts era English pottery bowl or planter made by Bretby. This 3-1/2" tall and 6-3/8" diameter bowl has a lovely light green glaze at the top graduating to a deeper moss green on the bottom; it has the Bretby mark, MADE IN ENGLAND and the 1644D pattern mark stamped into the bottom. This item is in excellent condition with no chips, cracks, losses, repairs or damage other than some very fine allover crazing. Expedited tracked shipping starts at $20 (to the US, other spots may vary). Items paid with a credit card will be shipped to confirmed addresses only. We do ship internationally. All of our prices are in $US. PLEASE NOTE: We DO NOT accept PayPal. A nice mid-Victorian early thermoplastic or vulcanite cameo brooch c1860-70. 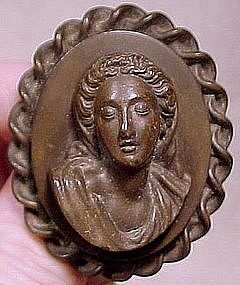 Made of the same medium brown thermoplastic used in the era for items such as photograph cases (and sometimes mis-described as gutta percha, and also known by the trade name of Vulcanite), this 1-7/8" x 1-1/2" brooch has fine detail, and it depicts a cameo of very high definition (she sits a full 3/8" above the surface platform). She is a classical period Greek beauty with her eyes closed and a look of rapture on her face - she looks like Penelope from the classic Greek epic myth. The platform surface is surrounded by a twisted rope border. It has a replaced pin with a safety catch, and this lovely pin is in excellent condition with no chips, cracks, staining, corrosion, repairs or damage other than the pin replacement. Surface shipping tarts at $6.20 (to the US - other spots may vary) - insured is higher, and mandatory on items over $95 if paid with a credit card. We do ship internationally. All of our prices are in $US. PLEASE NOTE: We DO NOT accept Paypal. A small and decorative handled silverplated candy or serving dish with a pressed glass bowl and a turned wood painted handle c1890. This dish stands 6" high and 5-1/4" long; it is 4-1/2" wide. It is of high quality, with conical feet, a threaded bolt securing the handle and nuts securing the base to the diamond shaped silverplated handle. This dish is unmarked but probably English, and the original fitted pressed glass bowl has a crisp and pleasant pattern. This item is in excellent condition with no chips, cracks, losses, dents, monograms, corrosion, repairs or damage. Surface shipping starts at $8.50 (to the US - other spots may vary) - insurance is included. We do ship internationally. All of our prices are in $US. PLEASE NOTE: We DO NOT ACCEPT PAYPAL, only VISA and MASTERCARD. 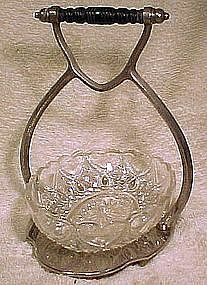 A Cellini Craft Arts & Crafts sterling ladle. This finely crafted Georg Jensen style sterling gravy ladle was made by the American Cellini Craft company of Chicago in the 1930s. This 6-1/4" ladle has a 2-1/4" wide bowl and a hand hammered finish on all surfaces; it has a looping arch of silver with nodes terminating in a ball which stands proud of the handle and is reminiscent of the Georg Jensen style. It is stamped CELLINI CRAFT HANDWROUGHT STERLING S 53 on the back; it has a Gothic style M.E.S monogram on the heel of the bowl. Formed in 1914, this company was bought out by Reed and Barton in 1965. This item is in excellent condition with no staining, losses, dents, corrosion, repairs or damage. All items are thoroughly and conservatively graded and all condition issues are noted; all items are vintage or antique and may have slight signs of gentle use. Expedited tracked and insured parcel shipping to the U.S. starts at $19 (other spots may vary, air is higher). Items paid with a credit card will be shipped to confirmed addresses only. We do ship internationally. All of our prices are in $US. PLEASE NOTE: We DO NOT accept PayPal. A pair of Victorian milk glass applied flowers mantle vases. 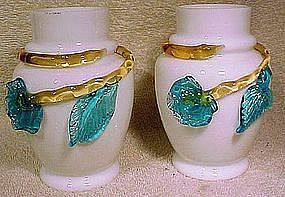 These 1880s vases measure 4-5/8" tall and they feature turquoise blue glass flowers and leaves and light amber coloured stems appled to the ouside of the vases; they are as typically found unsigned and they are in excellent condition with no cracks, repairs or damage other than the loss of one petal on one vase. All items are thoroughly and conservatively graded and all condition issues are noted; all items are vintage or antique and may have slight signs of gentle use. Expedited tracked and insured parcel shipping to the U.S. starts at $22 (other spots may vary, air is higher). Items paid with a credit card will be shipped to confirmed addresses only. We do ship internationally. All of our prices are in $US. PLEASE NOTE: We DO NOT accept PayPal. 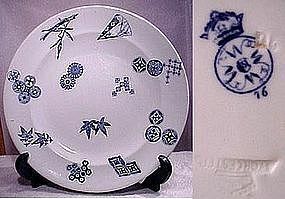 An attractive blue & white dinner plate by Royal Worcester (England). It is covered with Oriental motifs, which was quite popular in English china in the 1870s. It is date stamped for 1876 and measures 10 3/8" across. It is in excellent overall condition, but does show signs of use - there are cut marks on the plate, and the glaze shows darker/brownish at the edges where the glaze appears to have been more thinly applied. However, these details are minor, and it shows well and is completely useable if you wish. Surface shipping starts at $16 (to the US - other spots may vary) - insurance for loss is included. We do ship internationally. All of our prices are in $US. PLEASE NOTE: We DO NOT ACCEPT PAYPAL, only VISA and MASTERCARD. 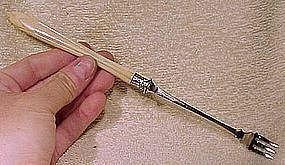 A fine quality 9-1/8" silver plated long pickle fork c1890-1900 with a lovely hand carved ivory handle. This elegant fork has a nice Art Nouveau style design on the fancy ferrule. It is in excellent condition with no chips, cracks, staining, losses, dents, monograms, corrosion, repairs or damage. Tracked packet air shipping is $16.50 (to the US - other spots may vary) - insurance and tracking included. We do ship internationally. All of our prices are in $US. PLEASE NOTE: WE DO NOT ACCEPT PAYPAL. A fine quality elegant etched glass water pitcher c1910-20. 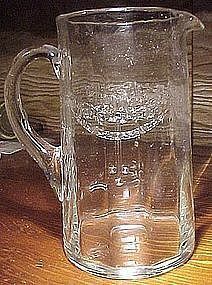 This lovely quality blown glass 8-1/4" tall pitcher has an applied handle, and it features a fine etched Arts and Crafts style motif with subtle vertical ribbing. The pontil is smoothly polished. We have had stemware previously in this pattern, which we have been unable to identify (can you help?). This pitcher is in excellent condition, with no chips, cracks, scratches, crazing, staining, repairs or damage. The fine white spots and lines and flashes are artifacts of the photography, and are not present in real life - it is in clear and excellent condition. Surface shipping starts at $16 (to the US - other spots may vary) - insured is higher. We do ship internationally. All of our prices are in $US. Please note: We do not accept Paypal. A genuine late 17th to mid 18th century hand made openwork European grade sterling pierced strainer or ladle with a gilded bowl. 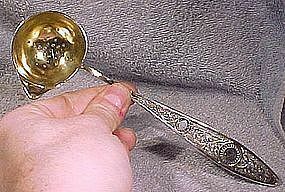 This unusual 8" ladle has a gilt and pierced 2-3/8" x 2" bowl with a pouring lip, and would be a slightly higher than 800 grade silver. The openwork handle has wonderfully ornate hand made wire-work with two central medallions, which have never been engraved/monogrammed. The handle is completely hand made and it is applied to the bowl with a rat-tail. It has two hallmarks on the back of the handle, the clearest of the two is a round punch with an animal figure that appears to be a standing bear with an I to the right (the stamp was slightly larger than the handle, so the animal head is missing). This appears to be a mark used in Berlin (Germany) in the 17th and 18th century. The other mark is a simple S or snake mark, and we have not traced this mark/maker. The style, workmanship, patina and appearance of the piece is consistent with German and Austrian silver being manufactured in this period, so the mark is consistent with the visible age of the piece (late 17th to mid 18th century). We haven't run across this exact utensil before, so are unsure which particular food or drink it was used to strain - it could be a variant of a fruit punch or mead or wine strainer or skimmer. It is in really exceptionally fine condition with no monograms, repairs or damage. The end of the filigree work nearest the bowl is not soldered, but this may be an aspect of design rather than a break in the silver that may have occurred. Expedited tracked and insured parcel shipping to the U.S. starts at $25 (other spots may vary, air is higher) - tracking and insurance is included in shipping quotes. Items paid with a credit card will be shipped to confirmed addresses only. We do ship internationally. All of our prices are in $US. PLEASE NOTE: We DO NOT accept PayPal, only VISA and MASTERCARD. An unmarked but Arts and Crafts period bud vase with a square and austere silver plated base and a hand blown and pulled square glass vase insert with a flared neck c1890-1900. This vase measures 7/8" across the base and it stands 6" high; it has all of the handcrafted style expected in the Arts and Crafts European style of this era. We were informed that it probably came from Scotland originally. This vase is in excellent condition, with no chips, cracks, dents, repairs or damage other than a slight bit of brassing at the edges of the stand. All items are thoroughly and conservatively graded and all condition issues are noted; all items are vintage or antique and may have slight signs of gentle use. Tracked packet insured air shipping starts at $17.50 (to the US - other spots may vary) - insurance and tracking is included. We do ship internationally. All of our prices are in $US. Items paid with a credit card will be shipped to confirmed addresses only. PLEASE NOTE: We DO NOT ACCEPT PAYPAL, only VISA and MASTERCARD. 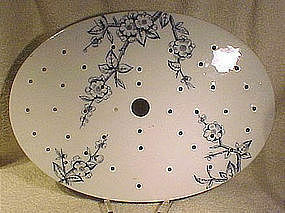 A Khyber Hawthorn ironstone drainer circa 1875 by Wedgwood & Co. This scarce serving platter sized pierced drainer is in the English ironstone transferware pattern Khyber Hawthorn, issued c1875-80 by Podmore & Walker / Wedgwood & Co. This 13" x 9-3/8" drainer features a great blue/black transfer of flowers, and it has the retailer's mark (James Green & Nephew, London). This rare item is in excellent condition, with no cracks, crazing, staining, repairs or damage other than a small chip with staining on the bottom edge (very old chip). A fine addition to any ironstone or transferware collection! Expedited tracked shipping begins at $27 (to the US - other spots may vary) - insurance and tracking are included in shipping quotes. We do ship internationally. All of our prices are in $US. PLEASE NOTE: we DO NOT accept PayPal, only VISA and MASTERCARD.